​Thanksgiving – it’s a time to gather with friends and family, reflect on our blessings, and hope we don’t infect those nearest and dearest to us with a foodborne illness! With one of the largest and most looked-forward to meals of the year right around the corner, we want to provide you with some quick turkey tips to consider before preparing your feast. 1. 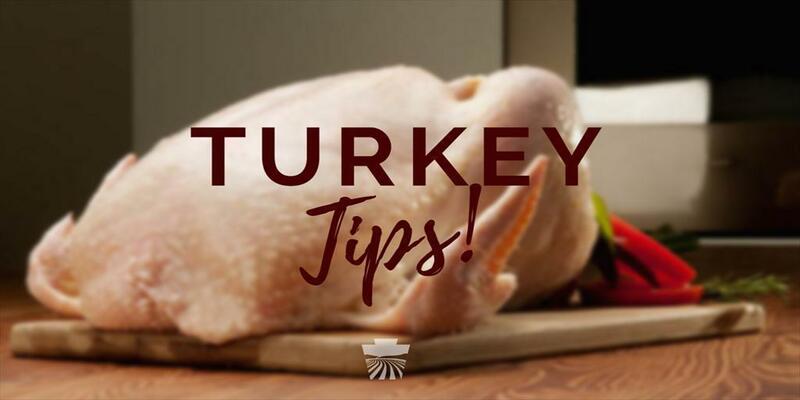 Thaw a frozen turkey in the refrigerator, not on the countertop. As soon as the exterior of the bird reaches 45 degrees Fahrenheit, harmful bacteria will start to multiply. Allow adequate time for your frozen bird to thaw, a ten-pound turkey takes about two days to thaw in the fridge. 2. If you stuff your turkey, stuff it immediately before cooking. 3. Labels can only estimate how long the bird will take to cook. Take the internal temperature to ensure the turkey is properly cooked. Put the thermometer into the thickest part of the muscle, the temperature should reach a minimum of 180 degrees and the center of the stuffing should reach at least 165. 4. Be sure to avoid contaminating other foods with raw poultry bacteria. If you’re preparing a turkey, wash your hands with soap and water immediately after handling. Cutting boards, utensils and other dishes used in the preparation of the raw bird should be thoroughly cleaned and sanitized (you can accomplish this with one tablespoon of chlorine bleach per gallon of water). 5. You’ve prepared, cooked and eaten a large meal, and now you want to visit with your family and friends! Don’t let leftovers sit out for more than two hours at most. The sooner they’re refrigerated, the better. 6. All leftovers should be eaten or frozen within three days; gravy and stuffing should be eaten within two days. 7. When re-heating your leftovers, heat to at least 165 degrees before serving.